2. The long journey and unsolved mystery. Here is where the mystery begins. Wladyslaw Penczak, the oldest son of Jan and Catharina, was born in 1891. Jan, Catharina and Wladyslaw Penczak arrived in the USA at Castle Garden in April 1891. According to US Census Records and Jan’s Naturalization application, Wladislaw’s birthplace is listed as Russia. Jan (Johan) Pecak’s passport has entries written in Russian. Zenon e-mailed a friend who is an educated expert in the Russian language and who has helped others in PolishOrigins Forum in translations of old Cyrillic hand-written records. Ryszard quickly replied. 1. Arrival in the old Galicia, my grandparents homeland. My husband, Jack, and I traveled to Poland in September 2010. After spending several days in Warsaw and Krakow, we started on our journey to research my family. Zenon was an invaluable resource, I cannot begin to thank him for the assistance in this project. After trying for many years to verify where my maternal grandparents came from, we finally made arrangements with Zenon to visit Poland and attempt to research my family. Fortunately, I have my grandfather’s passport issued by permission of Franz Joseph, Emperor of Austria-Hungary. My grandparents (Jan and Catharina Penczak) came from the section of Poland known as Galicia and ruled by Austria. The passport indicated that my grandfather, Johan/Jan Pecak, was born in 1865 in Nagoszyn. Census records in the USA indicated my grandparents were born in Galicia. Naturalization records also stated my grandfather was born in Nagoszyn, which is near Tarnow. Armed with only this information and verbal statements from my mother that my grandfather had one sister and that my grandmother worked for a noble family as a housemaid and had seven sisters who were dressmakers, my husband and I set out for Poland. Zenon met us in Krakow on Tuesday, September 21, 2010, and we drove directly to Tarnow and the Diocesan Archives Center. I can’t begin to explain how wonderful it was to find my grandfather’s and grandmother’s Baptismal records. My grandfather, Jan (Joannes) Pecak, was born in Nagoszyn in 1865 and my grandmother, Catharina Madej was born in 1863 in Korzeniow, the village next to Nagoszyn. 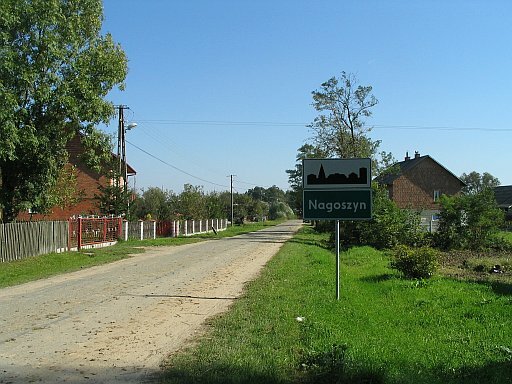 Nagoszyn – my grandfather’s place of birth.